This 12 hour course introduces both the philosophy and application of the Cycles & Segments methodology. Through cases and the presentation of materia medica, Dr. Herscu who articulated this approach, along with Dr. Rothenberg, illustrate how to use Cycles & Segments with all patients – from cranky babies to autistic children, from anxious adults to the chronically ill.
You will learn a practical way of organizing symptom information, which promotes a deep and integrated understanding of materia medica. Study without the cumbersome memorization of long symptoms lists and discover how to elucidate the Cycles and Segments of any remedy. Who will benefit from this introduction? From the experienced practitioner to the student or newcomer, anyone who wants to implement the Cycles & Segments methodology in their own practice can learn from this course. Everyone who wants a deeper understanding of materia medica – and a better way to learn materia medica – will enjoy this teaching. Read what our alum have to say specifically about the Cycles & Segments approach. 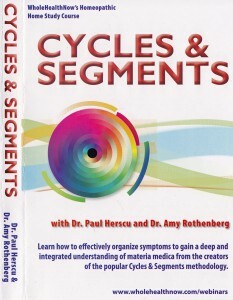 Learn more about the Cycles & Segments approach, and read some free sample articles. This is a multi-media course. Presentations include cases, repertorizations and supplemental materia medica. This 12 hour training course comes with an Audio CD (MP3 Files may not play on CD players which are not specifically MP3 compatible) and a Video DVD (WMV + MP3 + PDF file formats, DVD is NTSC) which contains six, two hour PowerPoint slide shows. This Home Study Course was originally produced in a live webinar format by WholeHealthNow in the Fall of 2011. All handouts from that course are included in this DVD set. For a sample of the format and the teachings of Drs. Herscu & Rothenberg, you can view this one hour webinar presentation – An Evening of Homeopathy: The Cycles & Segments Approach to Homeopathic Practice. This DVD set is the perfect complement to a subscription to the Herscu Letter distance learning program. We accept payment by check (made out to NESH) or by credit card (Visa, Mastercard and Discover only).